Year End Celebration: A Toast to Joy! Gather a group of your nearest and dearest to celebrate the year end with LIULI LIVING and our latest Toast to happiness! collection of LIULI glasses. An ideal size for baijiu, sake, soju or other Asian beverages, may this set of fine glasses heighten the joy fostered when around good friends. The history of drink is extensive. Like the enjoyment of tea, the pursuit of fine alcohol has evolved into a culture. When drinking, the Chinese are mindful of ambience. Occasions celebrating success, reunions, formal alliances are never complete without fine wine. 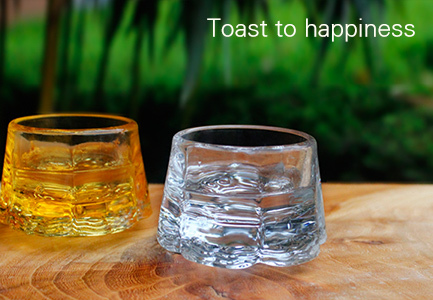 Toast to happiness! offers fine wine the vessel it warrants. Not only does the set enhance the refinement of the beverage, it enhances the mood and the atmosphere. LIULI LIVING designs have always stressed material, craft, function and symbolism. Hold Toast to happiness! in your hand to experience its ergonomically pleasing texture; the weight of LIULI and intricate water and cloud designs make every drink appear alive as light passes through it. From the water and into the clouds, Toast to happiness! is a contemporary specimen of fine craftsmanship. The Toast to happiness! collection is offered in two styles: Be Cloud and Be Water. Each style embraces one of these natural elements. In the world of Chinese blessings, auspicious clouds and ruyi water are charged with significance. The two styles reimagine classic motifs for a modern and relevant interpretation. Emanating from the center of the base and across the entirety of the LIULI glass, the message conveyed is an eternal and wondrous blessing. This set of wine glasses is feat of the imagination. LIULI invites light to a dance with shadow; through opulence and significance, let the most amazing moments settle down within your heart. Stable to the touch, it holds within unlimited possibility. This unique collection makes fine wine even more alluring - let your story begin with this one glass.